With two appearances on CBS This Morning and Fresh Air's most popular interview of 2017, Matthew Walker has made abundantly clear that sleep is one of the most important but least understood aspects of our life. Until very recently, science had no answer to the question of why we sleep, or what good it served, or why we suffer such devastating health consequences when it is absent. Compared to the other basic drives in life—eating, drinking, and reproducing—the purpose of sleep remains more elusive. 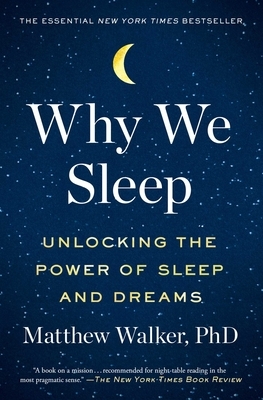 In this “compelling and utterly convincing” (The Sunday Times) book, preeminent neuroscientist and sleep expert Matthew Walker provides a revolutionary exploration of sleep, examining how it affects every aspect of our physical and mental well-being. Charting the most cutting-edge scientific breakthroughs, and marshalling his decades of research and clinical practice, Walker explains how we can harness sleep to improve learning, mood and energy levels, regulate hormones, prevent cancer, Alzheimer’s and diabetes, slow the effects of aging, and increase longevity. He also provides actionable steps towards getting a better night’s sleep every night. Clear-eyed, fascinating, and accessible, Why We Sleep is a crucial and illuminating book. Written with the precision of Atul Gawande, Andrew Solomon, and Sherwin Nuland, it is “recommended for night-table reading in the most pragmatic sense” (The New York Times Book Review).